Brain fog makes us irritable, tired, and forgetful. Kids? Work project? Diet & exercise goals? Taking care of things with brain fog is like wanting to drive 65 mph down a stretch of road - but being forced to go 40mph with your hazard lights aglow. Millions of Americans suffer from some sort of brain fog or cognitive slowing daily. While brain fog may be caused by stress, food sensitivities, toxins or infections - Lion’s mane can help. 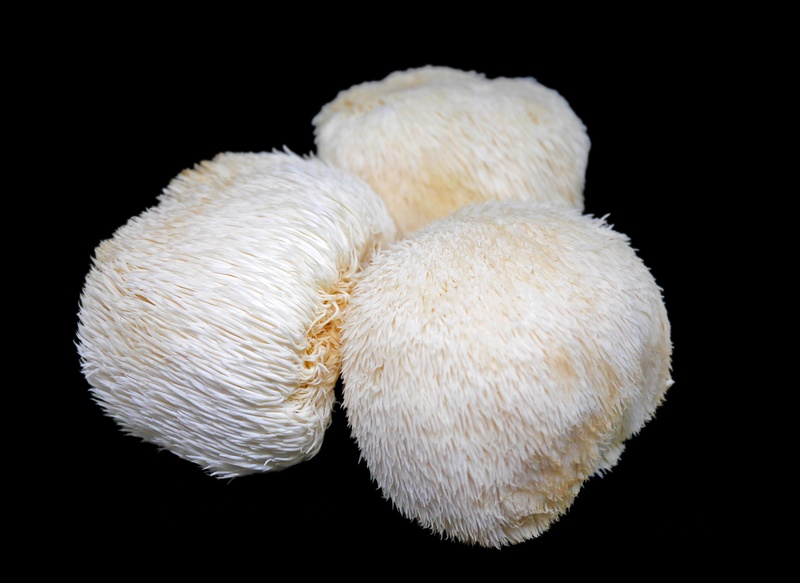 Lion’s mane (Hericium erinaceus, Yamabushitake, Monkey’s Head, Houtou, Hedgehog mushroom) is an edible fungus that has a long history of use in Traditional Chinese Medicine. While Lion’s Mane is now championed for its potential to help with anxiety, cognitive function (such as focus), and depression (1), Traditional Chinese Medicine has turned to Lion’s mane for gastrointestinal issues such as gastritis & gastric ulcers. I have struggled with gastritis in the past, as well as relatively severe problems with mental focus following a bout of acute mold toxicity - I find that when I take Lion’s Mane, it clears my mental fog like windshield wipers. I do find it ironic that a fungus would help me with a mold issue. While I had top reading, math and intelligence scores, I had testing that measured my focus in the bottom 1000th percentile, I have found Lion's mane to be a wonderful aid in clearing the fog and helping me focus. Mold toxins can stay in your system for up to 6 months or more following a single exposure. I have found that Lion’s mane can be helpful to protect nerve and brain health while the mycotoxins are being cleared. While I dealt with mold toxins, your story may relate to other brain insults like those mentioned above - stress, food sensitivities (wheat, grains, & dairy especially! ), other toxins & infections. In any case, if you feel that brain fog is slowing you down, lion's mane is worth a try. There’s more to Lion’s mane mushroom benefits than just a remedy for gut irritation and mental fog. & Anti-aging properties (1; 2; 3; 4; 5). While that sounds like a lot of benefits for one medicinal mushroom, Lion’s mane also contains hericerins, hericenones, resorcinols, steroids, mono-/diterpenes & aromatic compounds. Don't let the chemical names intimidate you, these are just active compounds believed to be responsible for Lion's Mane's wide scope of health benefits. I like using Lion's mane for gastrointestinal health too. It supports GI integrity as part of a complete gut lining and mucosal repair program. One of my secrets to gastrointestinal healing is the role of the enteric nervous system - and promoting health of the vagus nerve. Lion’s mane may play an important role in the prevention of Alzheimer’s and Parkinson’s diseases. Studies have shown that mushroom extracts like those found in Lion’s mane reduced neurotoxicity, stimulated nerve growth, and had neuroprotective, antioxidant and antiinflammatory properties (6). A target of therapy for Alzheimer’s and Parkinson’s patients is to stimulate the production of Nerve Growth Factor (NGF). Nerve growth factor functions just how it sounds - it helps stimulate neuron regeneration and growth. Erinacines A, B, C, & D, compounds isolated from Lion’s mane, have been discovered to be potent stimulators of NGF production (7; 8). Again, don't get caught up on the names - there will be no test - just understand that Lion's Mane contains compounds that have demonstrated some ability to stimulate nerve repair & growth. Lion's mane may help guard against day-to-day battles with anxiety, depression, or cognitive lapses as basic as mental fog, or degenerative conditions such as Parkinson's and Alzheimer's disease. These are tricky syndromes that require personalized care - so be sure to take Lion's Mane in an appropriate context. These findings have been in lab models and animal studies, and it is still largely undetermined whether the findings can be confirmed in the human brain at scale. Some placebo-controlled human trials have been conducted. One double-blind, placebo-controlled trial with 50 to 80 year old Japanese men and women with mild cognitive impairment showed significant improvements in cognitive tests when compared with placebo after 8, 12, & 16 weeks of study. The Lion’s mane was discontinued at 16 weeks. 4 weeks following discontinuation (20 weeks total), cognitive scores decreased significantly again (9). Another placebo-controlled trial discovered reductions in depression and anxiety scores after just 4 weeks in women consuming cookies that contained Lion’s Mane. The researchers also noted that the mechanism behind the improvements in scores appeared to be separate from the stimulation of NGF (10). While each case carries its own complexity and needs to be considered separately, Lion’s mane may be useful for those recovering from nerve injury from blunt trauma, damaged vertebral discs and other nerve-related injuries. For instance, a case study using rodents demonstrated enhanced regenerative activity and early recovery of nerves in peripheral nerve injury (11). While other mushroom extracts have shown regenerative potential, Lion’s mane has the most extensive research for its nerve health benefits. While mushroom supplements like Reishi and Cordyceps are very energizing - Lion's Mane side effects should not contribute to insomnia. Most turn to Lion's Mane to help you study or work a little later into the night. When you're ready to sleep, Lion's mane shouldn't give you trouble. Despite its natural potency, there are no reports of toxic effects from long-term consumption of Lion’s Mane (12).